Inhuman has quickly become one of my favorite titles each month, and I’m a die-hard X-Men fan with no prior familiarity with the Inhumans before the Terrigenesis Bomb that launched the “Inhumanity” event. Charles Soule is a master storyteller: while connecting with previous issues, Soule writes a complete story here with a beginning, a middle, and an end. 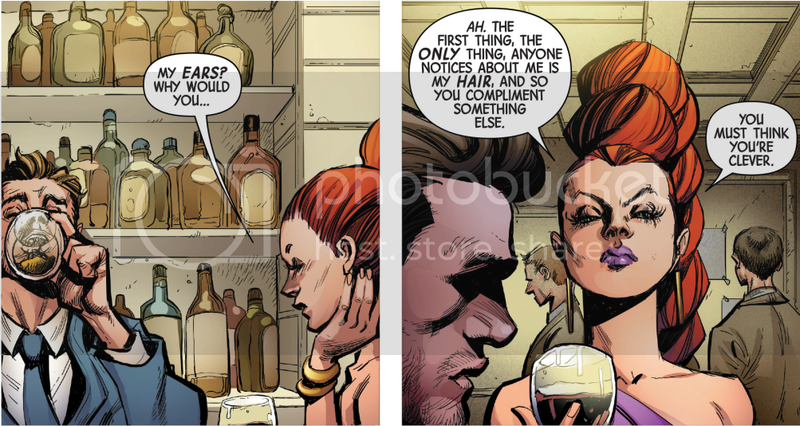 Medusa is sipping wine at a bar in Chicago, schmoozing with an Elon Musk-like pretty boy tycoon. We see Medusa showing so much personality and gravitas — a complex person, not just a stern queen. Ryan Stegman and Richard Isanove create beautiful art here: Medusa’s stylish dress and piercing green eyes are simply breathtaking. She owns each panel she’s in. Iso and Reader are interesting characters: Reader for his flexible morals and his loyalty to Iso; Iso for her fascinating power set and the adaptability and learning curve that she’s suddenly thrust into. I’m thrilled that, as was just announced, Medusa will be a member of the A-Force all-women Avengers title launching in May by G. Willow Wilson and Marguerite Bennett. Charles Soule will be continuing to write this title and other Inhuman titles later this spring. It’s a joy to read his work. All-New Hawkeye #1 variant by Sho Murase, out March 4!